When you are at the Princess Elisabeth Station, where is the closest grocery store? There is no permanent inhabitant in Antarctica. The majority of the visitors comes during summer. Some scientists spend the whole winter in stations but they rarely stay more than one year. Consequently, there is no village, no supermarket, no shopping mall. All the goods must be transported from lower latitudes by plane or by boat (in particular for the most heavy ones). It also means that if you forget something or if you need something very specific that is not available in the station, the delivery may take some time. Imagine you want some strawberries but this is not part of the stock at the station. You can look for the closest greengrocer in your favourite search engine on internet and check the distance. Of course, the same exercise can be done with any other product of your choice. There are a few small islands North of the Princess Elisabeth Station like Bouvet Island, which is only at 2100 km, but they are not famous for their shopping options. The South Orkney Islands, at 3000 km, have according to Wikipedia a population of approximatively 55 in summer and 14 in winter but again this corresponds to scientists in research stations. Australia is really far away. Kerguelen Island is at 3400 km. However, I was not able to find a nice shop there on the web. The Falklands is maybe a better option but the distance is still around 3800 km. Ushuaia in Argentina is at 4000 km. Finally, Cape Town in South Africa is at a distance of 4200 km. So, in any case, it is better to plan well the packing before you leave! How strong are the winds in Antarctica ? Antarctica is often referred to as the windiest continent on Earth for several reasons. First, there is not many obstacles at surface like hills, buildings or trees that can slow down the winds. Second, even though large portions of the continent are flat, some regions experience large slopes that can be followed by intense winds. Finally, large temperature contrasts can induce large pressure difference and thus strong winds, at a different scale but in a similar way as in air flows in your house. The strongest winds, called katabatic winds, occurred in coastal regions. The air in the interior of the continent, where the altitude of the surface is high, is very cold, and thus very dense. This dense air may literally flow down the slope towards the coast because of the gravity, accelerating until it reaches very high velocities. Those winds can achieve velocities higher than 200 km/h. They are so strong that, even in winter, they can transport all the sea ice floating at the surface of the ocean away from the coast as soon as it is formed, leaving the ocean ice free even though the air temperature is -20°C. Fortunately for us, katabatic winds very rarely occurs in summer close to the station and at our measurement sites. Nevertheless, the winds can still be very strong, blowing large amount of snow over long distances. What do you hear in Antarctica? The first thing is generally the wind. In some places, you may hear the noise of the generator providing electricity or a snow mobile but there enough space around to avoid those areas if you wish. Princess Elisabeth is more quiet than some other bases as the electricity is produced by windmills and solar panels. The ice itself is moving so slowly that you did not hear it if you are away from crevasses and ice cliffs that goes to the sea. Even in those regions, the noise is only occurring in some occasions when a movement or a collapse occurs. This is quite different from the sea ice that floats on the oceans and moves much more quickly. It can be broken by the winds or compressed making ridges, ‘playing’ a complex and sometimes scary music. There is nearly no life away from the coast so no bird singing or mosquito flying around you. Consequently, if you are away from buildings and not moving in a windless day, you basically hear nothing during minutes. That is an impressive feeling! What do we drink in Antarctica ? We drink basically melted snow. 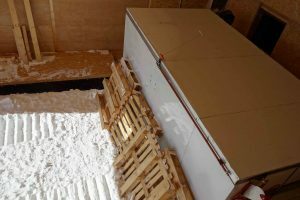 At the Princess Elisabeth station, the snow is collected in a big container. It includes a thermal resistance powered by the solar panels and the windmills. The snow is melted and filtered before we can use it in the kitchen and the bathroom. There is enough snow everywhere but the area where it is collected for drinking water is protected to avoid any contamination. The principle is the same in the field but at a smaller scale. No machine is available as in the station to carry the snow. So, whenever the container is empty or if someone has time, we dig some snow towards the container. The meltwater has a very low content in mineral. The taste is not great but it is fine. The closest one is some mineral waters that also have a very low mineral content. If you want to drink it directly, you may prefer to add a very small amount of salt or some syrup. Alcohol is never recommended for your health but you must be particularly careful here as it gives you a feeling of warmth while it contributes to lose faster your body heat and thus increases the risk of cold injuries. Additionally, being drunk is particularly dangerous is such harsh environment. At the Princess Elisabeth station, there is thus a big stock of alcohol-free beers! This did not forbid past explorers to order alcohol before they leave. For instance, Shackleton ordered 25 casks of MacKinlays rare old highland malt whisky for his expedition in 1907. The distillery reedited the blend a few years ago and you can probably find it. Very nice on an historical point of view! Alcohol may also be served for special occasions nowadays but this is for another post. 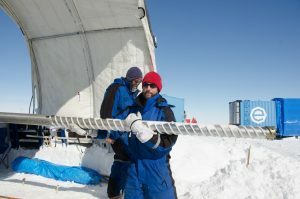 How do we drill an ice core in Antarctica ? To answer this question, you first need to know the length (and therefore the time span) of the ice core that you wish to extract from the ice sheet. If you are only interested by a short core a few to 10 meters long, for example to study the properties of the snow and firn (transition from snow to ice) you can use a simple and lightweighted system, entrained manually or with a small motor at the top. 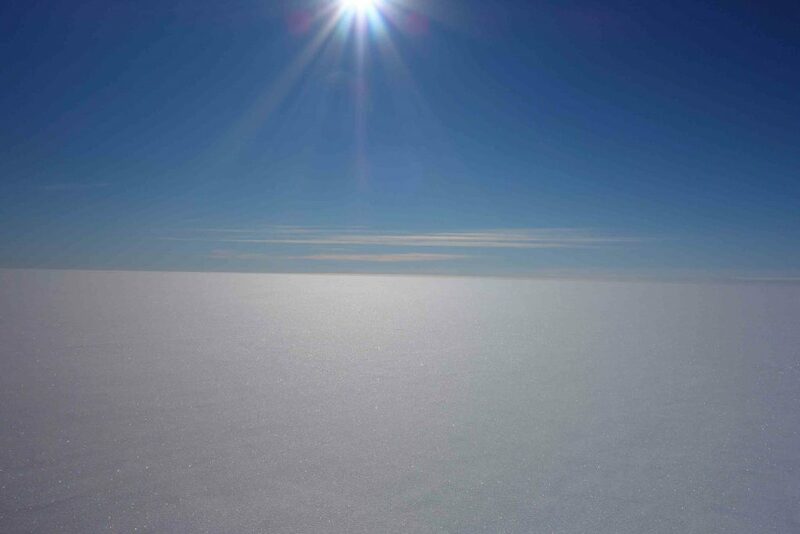 At the other extreme, if you want to recover 3000 meters of ice, all the way to the bottom of the ice sheet, covering up to 800.000 years, you need to gather all your friends internationally (and a lot of money!) for an international drilling program that might last more than 5 years (summers in the field). In that case, the drill is much more complex and send down the hole with the motor on top of the drill barrel, which is made of an upper container (tube) to collect the chips from the cutting of the ice, and a lower one to collect the core. At the bottom of the latter is the drilling head, equipped with 2-3 knives, that digs an annular hole, isolating the core from the ice sheet. The cutting chips are pushed up an “archimede’s screw” on the outside of the inner tube, where the core is collected. The chips are contained by an outer tube and are therefore driven up, to end up in the upper container. 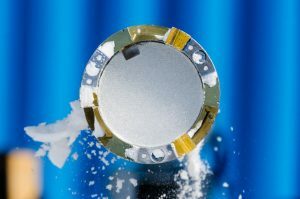 When up to 5 meters of core are drilled, the tubes are full, and the drill is brought back to the surface, the chips emptied from the upper container, and the ice core recovered from the inner tube. Everything is controlled from the surface by a computer connected to the drill motor by way of electrical cables within the hauling metallic cable. The drilling is performed within a drilling fluid slightly denser than the ice (once we are in the ice, ca. 100 m depth), in order to prevent the hole from closing down from one year to the other (the ice deforms under its own weight and closes the hole!). It also prevents mechanical damage of the core by the drill, when the pressure of the ice around gets too big compared to the atmospheric pressure in the hole. For intermediate depths, like at our Mass2Ant locations (300 m core, several centuries), we use a light-weighted version of the deep drilling system: the Eclipse drill (Canadian made). Because the quality of the cores was degrading under 100m depth last year, we will use a “wet drilling” version of the system, for the first time this year! Cross fingers and wait for the pictures of this year! Extracting the inner barrel (containing the core) from the outer barrel. In this light-weighted version, there is no dedicated chips chamber. The chips reaching the top of the spiral fall on top of the core in the inner barrel. …and a bad (broken in) core! 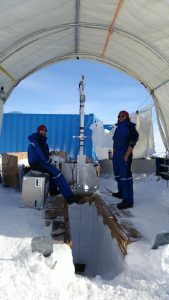 One of the most crucial information that we can extract from an ice core is the temperature that existed at the time the snow deposited at the surface of the ice sheet. We will make an attempt today to better understand the principle of this “thermometer of the Past” (Paleo-thermometer). A little bit of basic chemistry (good old school days! ): Ice is solid water (H2O). It is made of an assemblage of atoms of Oxygen and Hydrogen. Atoms are characterized by a core, made of protons and neutrons, and electrons spinning around it. The number of protons (atomic number) in the core define the “name” of the atom: Oxygen has 8 protons in its core and Hydrogen only 1 proton in its core. However, there exist several varieties of atoms of Oxygen and Hydrogen, differing by the number of neutrons in their core. Less neutrons in the core will make the atom lighter, more will make it heavier. We call these various atoms of oxygen or Hydrogen “isotopes”. To make a long story short, let’s talk about Oxygen only. A similar story could be told for Hydrogen in the water molecule. A molecule of water containing lighter isotopes of Oxygen will be lighter than a one containing heavier oxygen isotopes. Nature is such a nice friend to scientists that there is a simple (linear) relationship between the temperature at which the snow accumulates at the surface of the ice sheet and the proportion of light and heavy water molecules in the snow: the colder the temperature, the higher the amount of light water molecules that will be present in the snow and vice-versa. 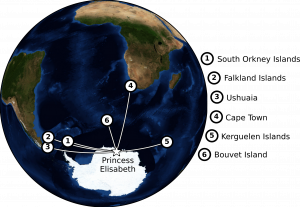 This is illustrated in Figure 1 for the Antarctic and Greenland. Scientists quantify the proportion of light and heavy isotopes in water molecules by the symbol d18O (for Oxygen, where the most abundant heavier version is 18O, as compared to the dominant lighter isotope 16O). When d18O is negative, the snow sample contains less heavy oxygen isotope than the “reference”, which is standard ocean water (the most abundant at the surface of the Earth) and vice versa. 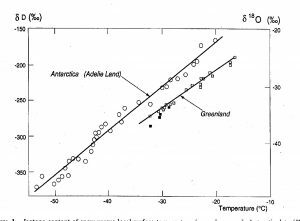 So, in brief, the lower the d18O of the snow, the lower the temperature when it fell at the surface of the ice sheet, and the relationship is linear (see Figure 1). The same will be true for d2H (also written dD, D is for Deuterium, the heavy form of Hydrogen, with 2 neutrons in its core). Figure 1 : the linear relationship between snow d18O (or dD) and the air temperature when it falls at the surface of the ice sheet: the principle of the paleo-thermometer. 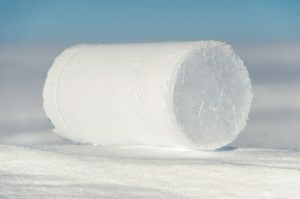 For each successive layer in our ice core, we can then measure the proportion of light and heavy oxygen isotopes (d18O) or Hydrogen isotopes (dD) in the snow (that became ice) to reconstruct the temperature that existed at the time that layer of snow was at the surface of the ice sheet: this is the principle of the paleothermometre. The beauty of the technique is that it works at all timescales: we will for example clearly see the difference between a glacial period (cold period with very negative d18O or dD) and an interglacial period (warm period with less negative d18O or dD) on long time scales. Not only that …we will also be able to discriminate summer (warmer) from winter (colder) each year. This is crucial, since we will then be able to “count the years”, and therefore date the core from those seasonal fluctuations of the water stable isotopes signals (d18O or dD), as shown in the example of Figure 2. Figure 2 : An example of d18O (black curve) and dD (light blue curve) profiles between 20 et 30 m in the Derwael Ice Rise ice core, in the vicinity of the ice coring locations of Mass2Ant (Philippe et al., 2015). 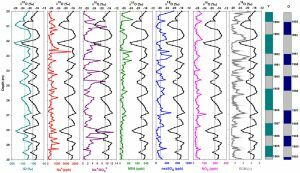 This depth interval covers 10-11 years of accumulation, as shown by the seasonal fluctuations of the water stable isotopes (d18O.et dD)….”Rendez-vous” in one of our next blogs to understand what the other profiles mean ! 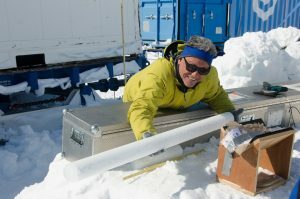 Ice cores are the memory of our Climate. 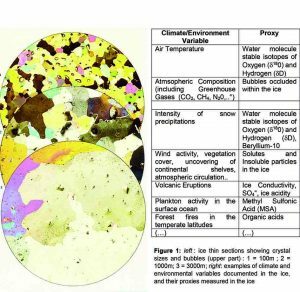 They are not the only one, though!… You can read the climate of the past in ocean sediments, corals, tree rings, stalactites in caves, lake deposits, peat deposits and many others. Not all of these archives give you the same amount of information though. Also, some are easily dated (a must for an archive, of course! ), other less easily. In our Mass2Ant project, as you already know, we will be more focused on the last centuries, to document the transition of the Climate into this new geological period that some of us refer to the Anthropocene: a period where the Climate increasingly feels the influence of Mankind (mostly since the Industrial Revolution). Which law applies in Antarctica? When we flew to Antarctica, we cross the international border at Cape Town but no border at Novolazarevskaya station or at Princess Elisabeth station. The readers with a legal sensibility may ask then which laws apply in this ‘international environment’? This is officially ruled by the Antarctic treaty. However, the situation is complex and may differ from countries to countries and for different parts of Antarctica. We will thus just focus on our field campaign. The panel announcing our flight to Antarctica. To go to Antarctica, you need to have a permit. This permit includes an evaluation of the impact of the trip on the environment. You cannot just go and travel where you want. Our permit was delivered by the Belgian government. Belgium considers basically that its laws applies in Antarctica to all the ones that receive a permit from Belgium. Consequently, for us, it is just the same legal rules as at home, with a few additional specificities in order to protect the Antarctic environment. After a long trip, we are now back in Belgium with our scientific results and full of memories from Antarctica. We followed the same path on the way back as for the way in. 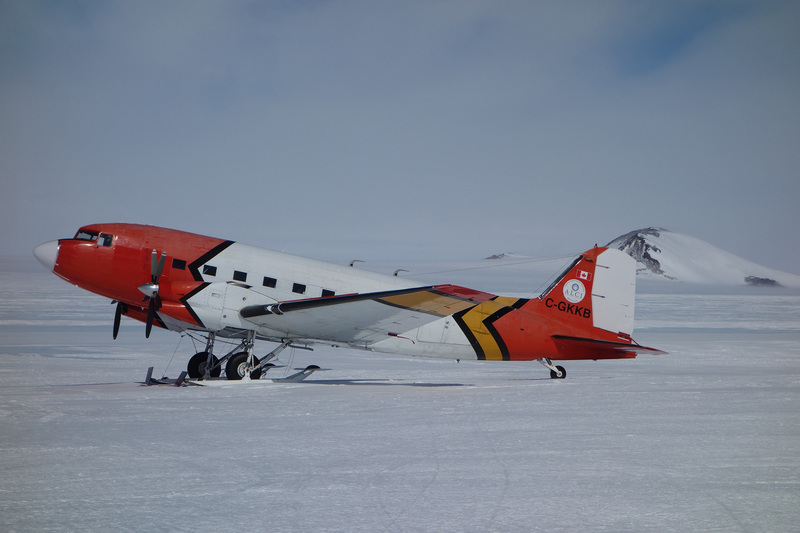 We first flew from Princess Elisabeth Station to the Novo air base Saturday evening on a DC3. This plane has a long history behind, including some activities during World War 2 and several updates since then. 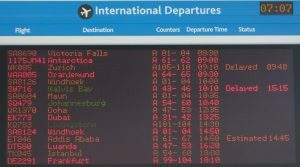 The journey continued to Cape Town and then Paris and Brussels. We arrived Monday afternoon, so in time for the Tuesday exams in our Universities! The data analysis will start as soon as we have dealt with all the issues that have risen during the seven weeks when we were away. It is the opportunity to thank all the people who contributed to make our campaign a success. The story started with the funding of our project by the Belgian Science Policy office (BELSPO) and the support we received from the BELSPO team since the launch of the project. The campaign was only possible thanks to the logistics well handled by the International Polar Foundation and its very dedicated team. We want to thank specifically Christophe, Pierrick and Alain that accompanied us in the field and Michel, Claire and Gigi for the organization of our mission and for welcoming us so warmly in Cape Town. The support from our family and friends is essential for all of us before, during and after the mission. Our colleagues in our universities agreed to take care of the daily business during those seven weeks, replacing us in some of our duties, and we are very grateful for that. We would also like to thank icefield instruments (White Horse, Canada) who provides the drill used for the ice core and the Australian Antarctic Division that shared with us a few tanks of Estisol, the drilling fluid. For the blog itself, a special thank goes to Alain and Sabrina who have posted all the messages we have sent, even during their holidays, and to the Press Office teams of UCLouvain and ULB that informed the media of our work. Without them, you would not be able to follow our progresses in the field! And of course, we would like to thank all of you for your support, your fidelity and your interest in this blog! If you have additional questions or comments, do not hesitate to contact us. What will you miss when leaving Antarctica? As mentioned in the previous post, we will be very happy to find back our ‘normal’ life after our stay in Antarctica. However, we will not leave the white continent without a few regrets. The exceptional environment marks all the ones that have the opportunity to stay here. We have reached our goals and enjoyed the time here. We have memories, photos but nothing really replace the sight, in all the directions, to appreciate the landscape. The pure air and the 24 hours of daylight are in strong contrast with our long winter nights in Europe. There is even no lighting system in the containers including our kitchen and bathroom as they are only used in summer. This means that we have not turn on or off the switch for the lights during weeks! I will also miss is the calm and the simplicity of the life. The choices are very limited in Antarctica and the number of possible activities is much smaller than in Belgium. This has of course disadvantages but it also means that the life is much more quiet compared to the life in Belgium where we are always so busy. In our camp, our next neighbor is likely more than 50 km away. No queue is shops, no internet except for emails with no or very light attachments, no television, no way to buy anything. The difference will be striking when we will arrive at Cape Town airport! And of course, the team will let strong memories for the work done and all the time spend together. I would like thus to finish this post by thanking all the members of the group who made this experience particularly rewarding and enjoyable. I would like to thank in particular Jean-Louis, our chief scientist, without whom the campaign would not have been possible. He managed with great skill, all the human, logistics and scientific aspects allowing us both to enjoy our stay and reach our scientific objectives. jauniaux on What do we eat in Antarctica ? Frank on Does your favourite Telecom operator provides roaming in Antarctica? 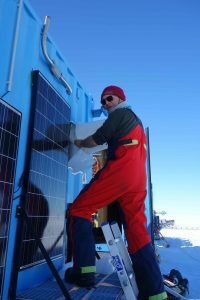 Stef Lhermitte on Does your favourite Telecom operator provides roaming in Antarctica?